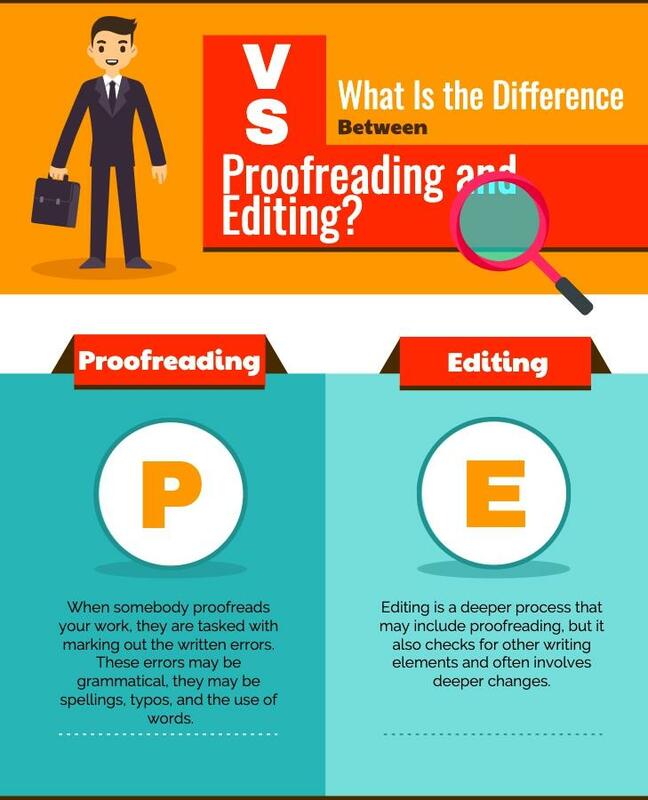 What is Proofreading and Why Is Proofreading So Important? Proofreading is where you or a third party checks a piece of text to see if it is fit for purpose. This doesn’t always mean simply checking the spelling and grammar. It means making sure that the writer’s desires are fulfilled without making deep edits to the content. For example, if you are checking a comic book, then there may be many lines of text that do not conform to grammatical rules. In this case, you may proofread for the unintentional use of incorrect words, or for punctuation that is confusing, or for typos. On the other hand, if you are checking an essay, you will need to fix every spelling and grammar error because that is what the writer desires in order to make the text fit for purpose. Editing is a far deeper process than proofreading. When somebody proofreads your work, they are tasked with marking out the written errors. These errors may be grammatical, they may be spellings, typos, and the use of words. Editing is a deeper process that may include proofreading, but it also checks for other writing elements and often involves deeper changes. An editor may completely alter the way the text is presented and written in order to make a point or change the meaning of the text. An editor may alter the text to account for flow, readability, contradictions and so forth. A proofreader will suggest changes and may even make the changes for you, but an editor may make deeper changes and may alter the text in a great number of ways. What is Proofreading in Terms of Academic Text? People see proofreading services on websites such as the Assignment Holic Writing Service website. The AssignmentHolic Service checks your work and marks it up so that you may see the changes it requires. They have a team of qualified proofreader who is able to work on very tight deadlines and for a very good price. What Does Proofreading Mean Regarding Academic Text? Academic texts are often marked down if they have poor spelling and grammar. Professors consider spelling and grammar errors to be a distraction from the overall meaning of the text, which affects the quality of the text, which is why an essay or dissertation with poor quality spelling and grammar cannot reach the highest/top marks. What Does Proofreading Mean Regarding College and University Projects? The essays, research papers, and dissertations you write for college and University need to be sterile. They need to be clinical and bland. There is no room for flair in terms of making a point and in terms of the written word. The accusation that academic texts are boring to read is correct. When your college and University work is proofread, it has to conform to very specific stylistic standards, and very strict spelling and grammar standards. Proofreading means checking your work to ensure it conforms to all these standards. If you think of proofreading as a way of making text fit for purpose, then the answer to the question “Why is proofreading important?” becomes obvious. Apart from ensuring that text doesn’t confuse the reader, you can also save a lot of embarrassment if you proofread your text before you publish it. Companies have been embarrassed by missing apostrophes in their signs, and other have been embarrassed by the misuse of words in their adverts. Proofreading is important to students because even if you do not lose marks for poor quality spelling and grammar, you may have a hard time getting top marks or high marks. Many marking guides state that a student cannot be marked over a certain level if the essay has poor quality spelling and grammar. How to Get into Proofreading? Get an English degree and join a writing service like AssignmentHolic. They often have requests for proofreading, and they can supply you with work on a regular basis. You may choose to become a freelance proofreader, in which case you will need your own website, a social media presence, and you will need something such as Google AdWords to advertise your services. You could always start by proofreading your own academic texts. Learn that proofreading is more than just running your work through a spelling and grammar checker. An automated checker will not recognize when you misuse a word, and they are terrible at picking up on typos. It takes a human eye to see what is right and what is wrong about a piece of text because humans understand the meaning of the text and its purpose, and that is vitally important to the proofreading process.